5 Days to Election Day - KPCC Presents "Meet the Judges"
Thank you to KPCC 89.3FM, and their morning show 'Take Two,' for giving their listeners a chance to "Meet the Judges." Please CLICK HERE to hear me on KPCC telling listeners about my candidacy. The June 7, 2016 Primary Election is two weeks and three days away. 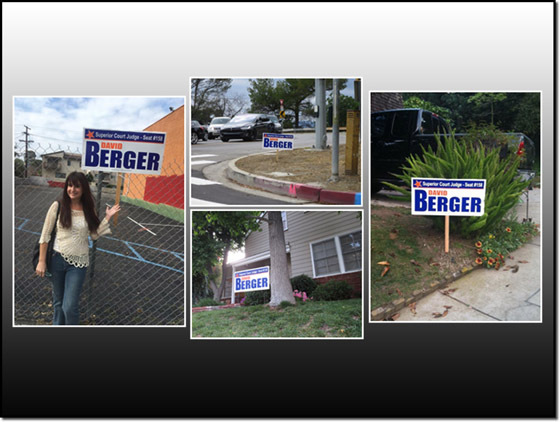 Thanks to the support of so many people my campaign has been able to afford a robust Yard Sign and Slate Mail effort. You have probably seen the yard signs and received the mailers. Your support for my campaign has also been an important factor in securing valuable endorsements. 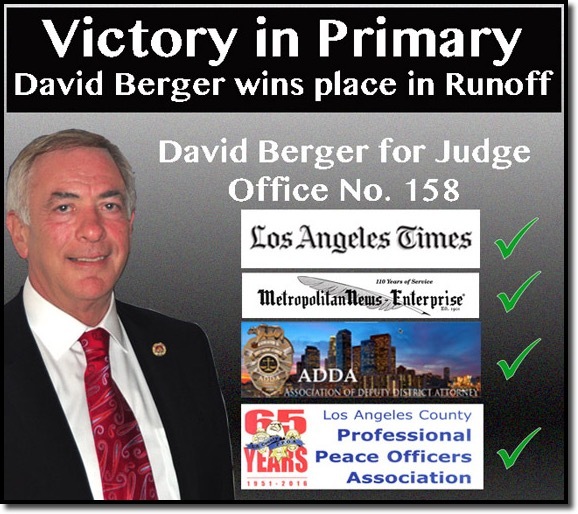 Without any doubt the endorsements of the Metropolitan News-Enterprise and the Los Angeles Times, together with the Los Angeles Professional Peace Officers Association and the Association of Deputy District Attorneys were all made possible because of the tremendous support that has been shown for my campaign. That support has come from Elected Officials like District Attorney Jackie Lacey, former District Attorneys Steve Cooley and Robert Philibosian, a large number of Superior Court Judges and Commissioners, attorneys and people who have donated to my campaign. Harder to measure, but increasingly important, is Social Media. My campaign FaceBook Page is the hub of this activity and the push is on to try to increase the number of 'likes' ahead of election day. Additionally, many people have cc'd me on chain emails to their friends making various recommendations for judicial candidates, as well as others on the ballot. The most encouraging thing here is that while many of the emails favor one party or another, they all agree on who is the best candidate for Judge of the Superior Court, Office No. 158; David Berger. I am honored to have your support and look forward to an exciting election day! Voters have a tough choice when it comes to the Judicial Elections. There's precious little information out there to guide their choices, so when the LA Times weighs in on who they think is best qualified for the job, voters tend to pay attention. 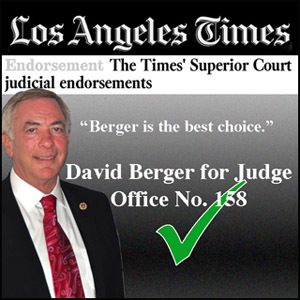 On April 28, 2016 the LA Times endorsed David Berger for Judge of the Superior Court, Office No. 158, concluding "Berger is the best choice." 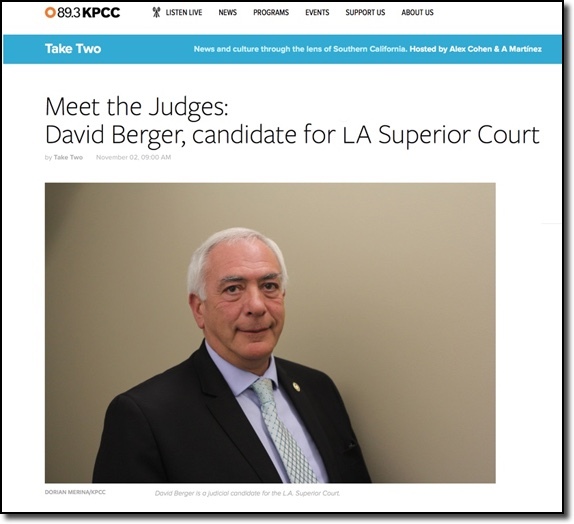 One of the best services to voters puzzling over how to vote for judge is the set of candidate ratings produced by the Los Angeles County Bar Assn., the region’s largest voluntary organization of attorneys. The County Bar’s Judicial Elections Evaluations Committee engages in a review of the candidates and places each of them in one of four categories, from Exceptionally Well Qualified to Not Qualified. The Times often agrees with the committee’s assessments. But not always. 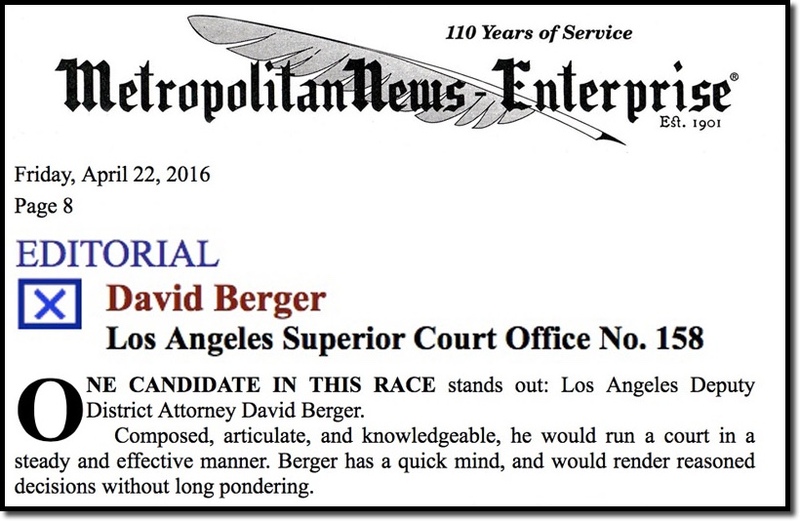 This year’s ratings have not yet been published but the Metropolitan News-Enterprise has reported that Berger was rated Not Qualifed. The Times nevertheless finds him to be the best of the candidates in this particular race. He has a long and successful record as a prosecutor, and his free expression of opinion in that capacity does not make him less fit to serve impartially as a judge. 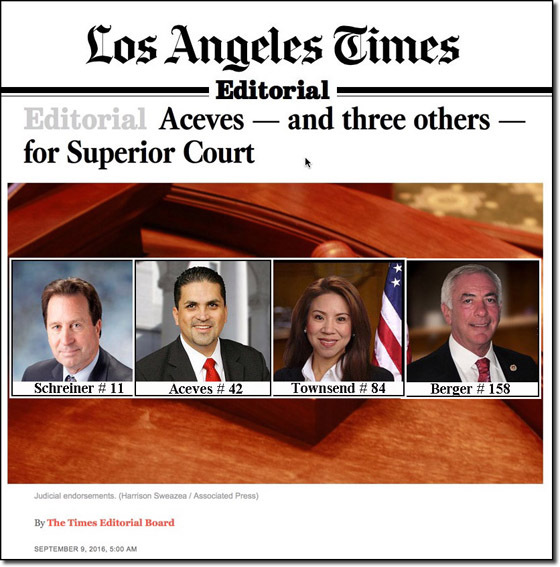 Also running are Deputy District Attorney Fred Mesropi, Los Angeles Deputy City Attorney Onica Valle Cole, and Van Nuys sole practitioner Naser “Nas” Khoury. Among the five, Berger is the best choice. April 22, 2016. 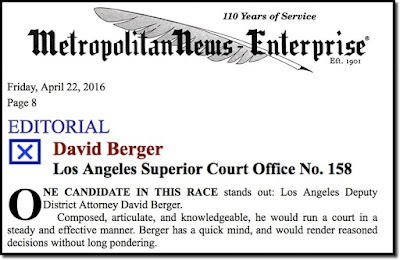 Los Angeles' leading legal newspaper, the Metropolitan News-Enterprise, announced their endorsement of David Berger for Judge of the Superior Court, Office No. 158, one of four open seats in this years' judicial elections. 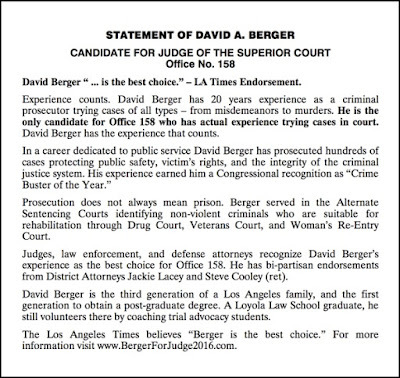 ONE CANDIDATE IN THIS RACE STANDS OUT: Los Angeles Deputy District Attorney David Berger. Composed, articulate, and knowledgeable, he would run a court in a steady and effective manner. Berger has a quick mind, and would render reasoned decisions without long pondering. At 59, with 20 years experience as a prosecutor, he would not flounder. The only other candidate in the race worthy of consideration is Deputy Attorney General Kim L. Nguyen. At 39, she comes across as somewhat younger than her actual age. While Berger is mature and urbane, Nguyen—a delightful person—is sprightly. She is, like Berger, quite articulate and, like Berger, would surely conduct herself on the bench with appropriate judicial demeanor. However, she has never handled a trial and, unlike Berger, would not be up to the job from Day One. There is only so much that can be taught at Judges School. We emphatically disagree with her view that her candidacy should receive special consideration because, if elected, she would become the Los Angeles Superior Court’s only Vietnamese American judge. In our view, ethnicity, religion, gender, and sexual orientation are factors that should not result either in merits or demerits; either way, it’s mindless discrimination. Ability, and that alone, is what should count. Besides, it could be that one of her opponents, attorney Naser Khoury, if elected, would be the court’s only Jordanian American judge. Perhaps Deputy District Attorney Fred Mesropi would be the sole Iranian American judge on the court. Berger would be its only British American member. Deputy Los Angeles City Attorney Onica Valle Cole might well be the only African American/Mexican American on the bench. But should any of that matter? Mespropi, while a misimpression that there is a canon forbidding judicial candidates from criticizing opponents, was quite willing to adhere to that supposed stricture. He conveyed that during an interview session with this newspaper. It is disquieting that someone who might become a judge would think that such a patently unconstitutional rule had been promulgated, and would be enforceable. Mesropi also expressed the notion that it might be a matter warranting discipline if Berger were to maintain his blog if he became a judge. Yet, judges do possess First Amendment rights. While it is established by case law that some political activity on the part of judges may be proscribed, a ban on all journalistic expression by a judge is not in effect, and surely could not, constitutionally, be erected. 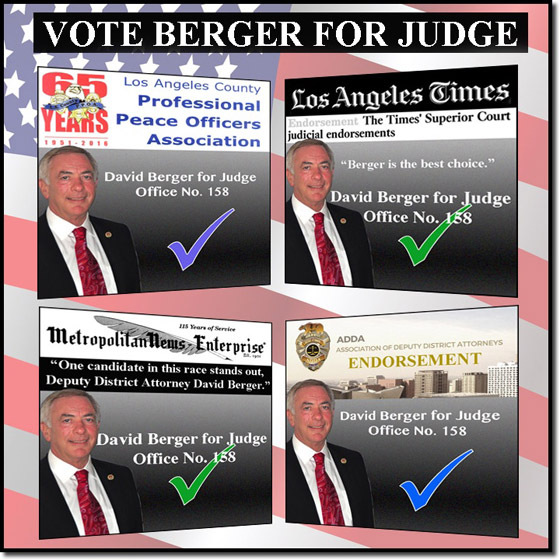 There is no reason to anticipate that if he were elected as a judge, Berger would engage in the sort of robust expressions of political views he has in the past. On his blog now is an objective run-down on each of the judicial candidates as of the time of the posting, including his opponents, with links to their websites. In answer to a hypothetical question, Mesropi asserts that it would be “not becoming” for a judge to write a newspaper column. Yet, we’ve never heard criticism of Court of Appeal Presiding Justice Arthur Gilbert for writing a column for a particular newspaper (we regret not this one) over the past 28 years. Nor do we know of criticisms of First Lady Eleanor Roosevelt for writing her “My Day” column. Mesropi would be willing to have his right to criticize opponents in his political race forbade, and would see no problem in generally restraining speech of candidates or judges. We see that as a problem so far as his ability to grasp that there are limits on governmental regimentation of individuals and curtailment of their liberties. Though the candidate is personable and, from what we have gleaned, an able prosecutor, we do question whether he possesses aptitude for judicial service. Mesropi tends to make assertions based on suppositions—such as assuming that Nguyen, because she is in the A.G.’s Office, handles criminal appeals when, in fact, all of the work she does is on civil cases. The Los Angeles County Bar Association has rated both Nguyen and Mesropi “well qualified” and has tentatively branded Berger “not qualified” (apparently based on his expressions of political views, in past years, on his blogs). We believe strongly that the subcommittee of the Judicial Elections Evaluation Committee has it wrong. In our view, it is Berger who is well qualified while we see Nguyen as unripe for a judgeship (“qualified” at best), and Mesropi as unfit for one (“not qualified”). She has handled one half-day calendar. That she has four more stints scheduled is irrelevant. She is attempting to create a false impression as to extensive past service. Cole has a somewhat theatrical manner. She would be ideal for the role of a television judge. But not a judge of the Los Angeles Superior Court. Khoury—who has a history of a reckless driving conviction, resulting in a private State Bar reproval, tax liens against his law partnership, and going into bankruptcy—does not display the judgment expected of a jurist. While his devotion to his religion is commendable, interjecting religion into a campaign for a secular office is, we would suggest, inappropriate. While Nguyen has impressive attributes, it is clear that David Berger possesses credential far exceeding those of any of his rivals. We endorse his candidacy. I say “a few cases” because the vast majority of cases would end up with a plea rather than a trial. Oftentimes that was because Judge Fox would undercut my offers and take an open plea - much to the chagrin of my supervisors! Judge Fox does an excellent job of taking a plea. He does it thoroughly, but manages to do it in such a way that it’s almost like he’s having a conversation with the defendant as he explains the rights that must given up before saying “Guilty’ or ‘No Contest.’ Even the most poorly educated defendant understands what’s going on, and it’s a testament to the way Judge Fox shows his respect for all those appearing before him. I left Beverly Hills in 1999, but over the years I returned there when assigned to special units. It was always a pleasure to see Judge Fox and catch up on news. In 2011 I was transferred back to Beverly Hills and was assigned to Judge Fox’s courtroom. Some things had changed - we were handling felonies not misdemeanors, but some things hadn’t changed; Judge Fox still treated all before him with courtesy and respect, and he still undercut my offers! In 2013 budget cuts forced the closure of the Beverly Hills Courthouse for criminal cases, and we all packed up and moved to the Airport Courthouse. 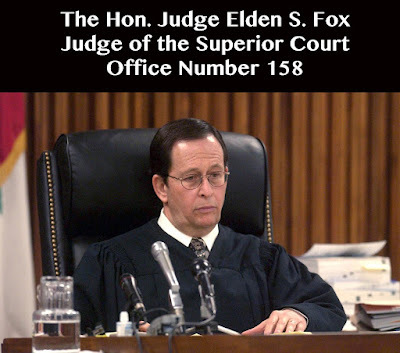 I think it must have been a very hard time for Judge Fox as he had spent so much of his working life in the Beverly Hills Courthouse - first as the Deputy In Charge of the DA’s Office on the 4th floor, and then as a judge on the second floor when he was appointed to the bench in 1991. It must have been around the time that we all settled into our new ‘home’ at the Airport Courthouse that I sensed that Judge Fox might be considering hanging up his robes. It was also around that time that I realized the thing I most wanted to do with my career was to become a judge; not just any judge, but one as excellent and respected as Judge Fox. Wanting to become a judge is one thing, however, actually being able to do it is another. I spoke to Judge Fox about my ambitions, and to my relief he was enormously supportive. He also told me that he had been thinking of retiring but, would delay his decision until the 2016 election so that I could run for his seat if he decided to retire. In the past five I have appeared in Judge Fox’s courtroom on a daily basis. He’s seen the way I present preliminary hearings, conduct jury trials, court trials, probation violation hearings and argue motions. Over the years I learned from him how to fairly evaluate a case - assess its strengths and weaknesses, assess the defendant’s criminal history and chances at rehabilitation, and then formulate an offer that is both fair and equitable to both sides. What has become interesting is the way that our offers have become so alike. It’s something that often surprises defense attorneys - that the DA’s offer is more or less the same as the judge’s. In learning so much from him I would like to think that I have demonstrated that I was the right candidate to continue his legacy of being respectful to all, knowledgable in the law, widely experienced, scrupulously fair, fiercely independent, and beholden to none. And so it was, on Friday afternoon, March 11, 2016, that we both made our way to the County Registrar’s Office in Norwalk. I would file my nominating papers to run for his seat, he would not file his, thereby formally announcing his retirement. There was a torrential downpour as we navigated the 18 miles from the Airport to Norwalk, and the traffic was so bad that at one point it looked like we might not get there in time for the 5pm deadline. How ironic that would have been. Nevertheless, we made it in the nick of time. The drama of the drive perhaps masked the solemnity of the moment; for me perhaps embarking on a new career, for him, signaling the end of his. I cannot tell you how deeply grateful I was to have Judge Fox at my side as I completed the paperwork and formalized the next phase in this long process. It is a credit to his loyalty that even though he was extremely jet-lagged, having only days earlier returned from a long vacation in Asia, he was willing to give up precious hours when he could be resting, to stand by me. Any hope that waiting until the last moment to file papers might deter other candidates from running for Judge Fox’s seat soon vaporized and it now seems that I’m in a formidable five-way race. It won’t be easy and it’s very likely that this race will go all the way to a runoff election in November between the top two vote-getters in June. I am confident, however, that with your support I will make it to the runoff where I will win. In concluding this long post, I hope it’s obvious to you that I owe a deep debt of gratitude to Judge Fox for hopefully being the book-ends of my career at the DA’s Office, for being such a fine example of what it takes to be an excellent judge, and for being so supportive of my candidacy. 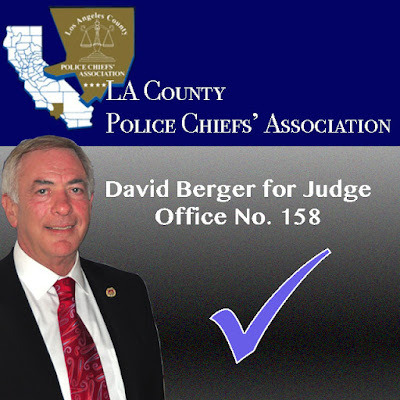 When you cast your votes in the June 7, 2016 election I hope you will remember reading this, and that when you ask yourself “Who better to continue Judge Fox’s legacy?” you will answer that question with a vote for David Berger for Judge of the Superior Court, Office Number 158. With the 2016 Primary Elections just 5 weeks away, I've decided to take control of my campaign website so that I can rapidly post updates on my campaign for Judge of the Superior Court, Office No. 158. Much of the information here can also be seen on my campaign Facebook page: https://www.facebook.com/Berger2016. Please either bookmark this page, or better still, subscribe to this blog so that you'll receive an email letting you know whenever a new post has been made. I will not sell, share, or otherwise use your name, email address, and any other information gathered when you subscribe to this blog.